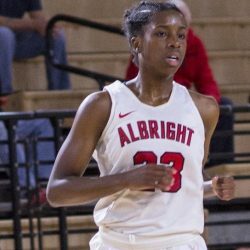 DANBURY, Conn. – A day after winning the MAC Commonwealth Player of the Week, Albright women’s basketball senior Alysha Lofton earned the ECAC Division III South Player of the Week award, announced by the organization on December 19. Lofton did a little of everything for the Lions in their 65-58 non-conference road win over King’s on Sunday afternoon with a game-high 21 points, on 8-of-16 (50%) from the field, and posted a team-high nine rebounds with seven of them being defensive. In addition, she registered a career-high eight assists along with two blocks and two steals in the win. Lofton also played a key role from the free throw line by making three of four attempts on the afternoon. This is the second time in her Albright career that Lofton has garnered honors from the ECAC after earning the weekly award in January of 2017. She currently ranks in the top-10 in the MAC Commonwealth in the majority of offensive statistical categories.